The dominant grape here is red. Leading varieties are Merlot, Cabernet Sauvignon, Syrah, Pinot Noir and Canada’s first successful Zinfandel block or section of grapes. Whites are also planted, notably Chardonnay, Sauvignon Blanc and Viognier. The leading producers that get Osoyoos Lake Bench grapes include Jackson-Triggs, Mission Hill, CedarCreek, Osoyoos Larose, Inniskillin Okanagan and Nk’Mip Cellars. 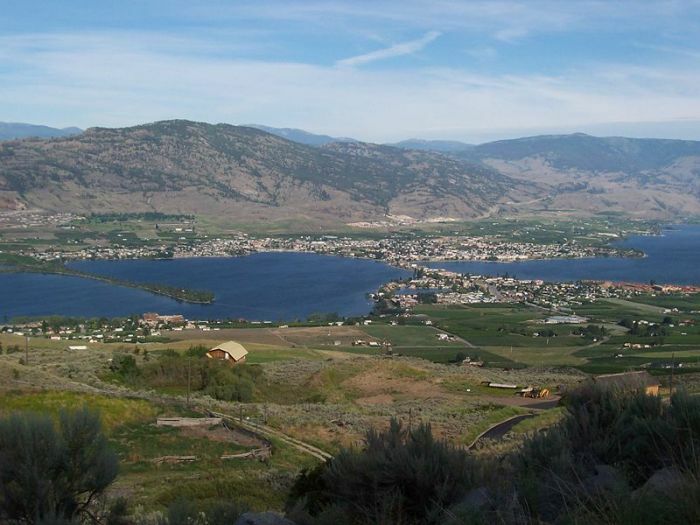 Constelation Brands (owners of Jackson -Triggss) have the most extensive vineyards that were planted in 1998 and 1999 on the eastern and northeastern side of Osoyoos Lake, on slopes rising about 60 metres (200 feet) above the valley floor. These have been named Bull Pine, Sun Rock, Bear Cub, McIntyre and Whitetail. The bench on the western flank of the valley is perched slightly higher and has a more complex mix of sand, clay and gravel. The Town of Osoyoos wraps it self around the lake. Just beyond the town city centre you find its many wineries and vineyards. Some of the more noted wineries are Nk'Mip Cellars, La Stella and Twisted Tree with numerous other wineries resource grapes from the area.